Indulge their double addiction to chocolate and coffee with this fabulous living tree gift. Send a baby tree of your choice along with a fine selection of these double vices - chocolates and coffee. Please select tree choice from drop-down menu. 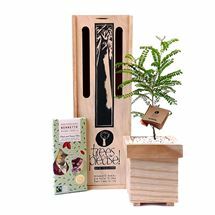 Give the gift of delicious chocolate decadence with this lovely living tree gift. The chocolates will probably disappear rather quickly, but the tree can be planted and enjoyed for years to come. Baby tree of your choice (28-33cm) presented in a custom-designed wooden planter containing high-quality potting mixture, finished with white river stones. A beautiful living tree of your choice sent with delicious sweet treats - perfect for indulging in with friends and family. 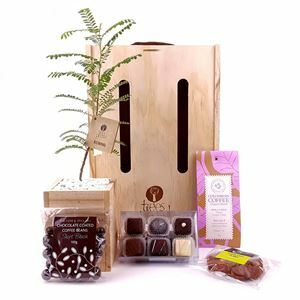 Indulge friends and family with this wonderful gift of a living tree with a selection of sweet treats. 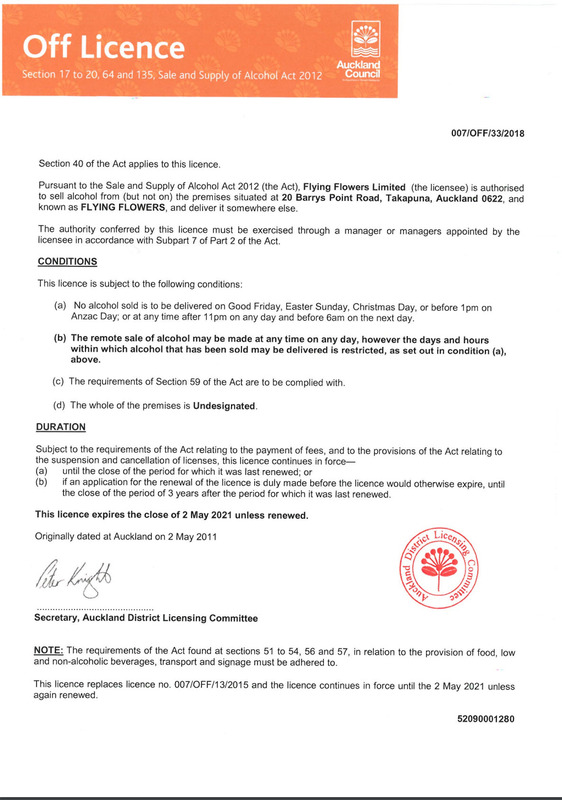 Perfect for sharing and enjoying on any occasion, with the delight of a living tree to plant and enjoy. An unusual gift of a baby Lemon or Lime tree with two mini bottles of Gin and Schweppes Tonic - all the ingredients for enjoying a G & T at your leisure! The G and T won't last for long but the tree can be enjoyed for years to come. Your recipient will love this creative and thoughtful gift of a G & Tree - a living baby Lemon or Lime tree accompanied by two mini bottles of gin and Schweppes Indian tonic water. The G & T won't last for long but the lemon tree will be enjoyed for years to come. 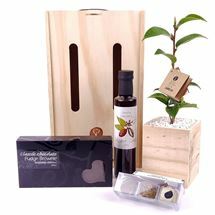 Send love with this beautiful gift of a living tree of your choice with Organic Chocolate made in Switzerland by Bennetto. It's delicious so will soon be eaten but the tree will give joy for years to come. Baby living tree of your choice (36-43cm) presented in a custom-designed sustainable planter box containing high quality potting mixture, finished with white river stones. Please select tree type from drop-down menu. 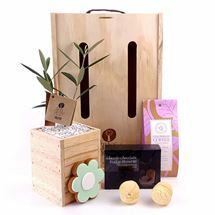 special untreated plantation pine wooden carry box.